V'yr Vorsa towers over most average people. Tall and very fit, with just enough femininity showing through, her physique is an eye-catcher for both genders. However, while she does appear Near-human, her true nature is revealed through her hair and skin. Vines, branches and leaves form most of her hair, with the latter showing only in certain conditions such as warm and moist weather. Her hair is always in motion, like a living creature hanging from her head. It reacts to her environment and her emotional state, depending on the situation, as much as her facial expressions do. The leaves wither and fall off if she is in cold or harsh weather, sad, under emotional stress or otherwise emotionally compromised, and flowers often bloom when she is warm, happy, at ease or relaxed. Vorsa's eyes are golden with a fiery accent. They can be equally filled with caring, compassion and love as well as determination, bitterness or resentment. Her glare is enough to shatter the morale of seasoned veterans, just as her reputation is enough to make her enemies cautious. Vorsa usually wears comfortable clothes - to her, at least - that don't restrict her movement and breathe easily. Vorsa almost always wears her custom-built plastoid armor. This light, ocher colored armor grants her sufficient protection while retaining freedom of movement. The armor has her General rank insignia engraved into its left breastplate. V'yr Vorsa has spent centuries studying many topics, including military tactics from various species. She has a very focused mind when it comes to strategy and war and often spends hours and days reading through maps and intel reports, planning and calculating. Her Natural Endurance has an enormous role to play in this, since she needs no sleep or rest except for sunlight and water. Vorsa never underestimates an opponent and so she focuses on the minutest details so that every stratagem is part of a bigger whole and never one single move. Enemies are often left flatfooted by her maneuvers, but the amount of planning and overthinking often leaves many of her own subordinates baffled and confused. No plan is fool proof and Vorsa rarely seems to calculate human error into her plans. V'yr Vorsa has a very strong Force connection with two individuals - her sister, A'lora Kituri, and her partner, Turel Sorenn. This bond is strong enough that she can effortlessly feel their presence when they are close and even feel some of their emotions over vast distances. Telepathy comes easily with them and basic emotions like danger, excitement or encouragement are felt clearly. Stronger emotions, such as death or turmoil register in vague intuition, but are present regardless. This bond allows the three to connect more strongly on the battlefield through Force Meld, making them a uniquely strong force of destruction. Their movements and attack patterns are well coordinated and precise, giving them an edge even over stronger opponents when they work as a team. V'yr Vorsa walks with an ethereal grace that makes her seem otherworldly to other mortal species. Even though she is only four centuries old, life in an unforgiving galaxy has given her unparalleled focus, balance of character, and wisdom. She is often the one others seek out for guidance and leadership, always on the tip of the spear in war, or the voice of reason in the Council chamber. She is a shining beacon to the masses: a fixed point in space and time they can cling to in the most dire situations. She must never falter in her convictions, else all is lost. This has often manifested in her not being able to find solace in anyone else except herself, as she is the support that holds others up. Though her adamant visage holds strong, in the very worst of times her insecurities show through, for better or worse. Vorsa holds a deep resentment for the Darth Pravus' methods, finding them degenerate and evil. 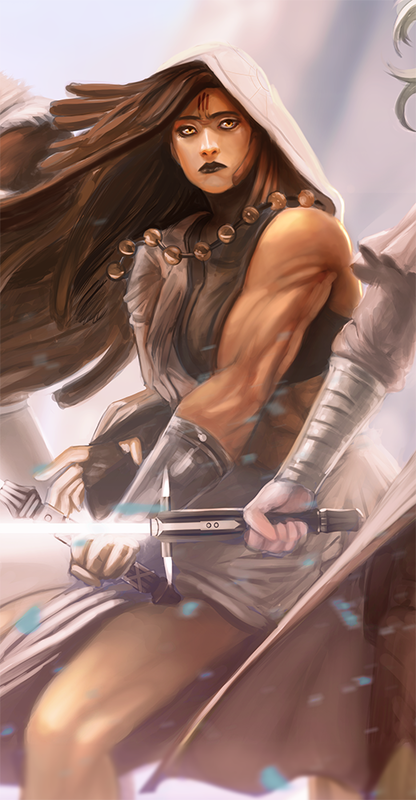 Her mission in life, after the destruction of her home, has become ending the threat of the Sith once and for all. She is always on the search for sympathizers and allies to fight the Dark Council and their armies. Vorsa realizes that she cannot help everyone, but she tries he utmost nonetheless. She has created a network of agents able to help those oppressed by the unforgiving regime. She would gladly give her life and the lives of thousands to keep millions alive, and her mission, while sometimes divergent from the tenets of her Order, will always be the preservation and safekeeping of life. V'yr Vorsa has practiced the art of Vapaad for decades. Her resolve and focus make her excel at this form, keeping a steady balance between the light and dark aspects of her personality. She has also become proficient in using Amplification to gain an upper hand at the right moment, as well as Telekinesis to manipulate and use the environment to her advantage. However, despite her aggressiveness on the field of battle, Vorsa is also well known for empathetic nature, and this very empathy can sometimes backfire on her. If she ever feels pity for a pathetic opponent she will likely spare them the death they undoubtedly deserve, which often opens her up to attack. V'yr Vorsa always has a very specific objective on the field of battle. Be it destroying a shield generator, stopping an enemy offensive or killing her opponent, she will proceed with her mission without delay. Her determination is very much fixated on what she has set out to accomplish, which often brings her into troublesome situations with highly resourceful opponents. On the battlefield proper she will disable, maim and kill if she must, but she will never relent and she will accomplish her objective as planned, under any circumstance. Many enemies has fallen because her steely resolve and deadly tenacity. Then again, so have many allies.